Heroes, Heroines, and History: History of Charm Bracelets--and a Giveaway! History of Charm Bracelets--and a Giveaway! Susan Page Davis here. I love my charm bracelet. I got it when I was about 12 years old. When did you get yours? 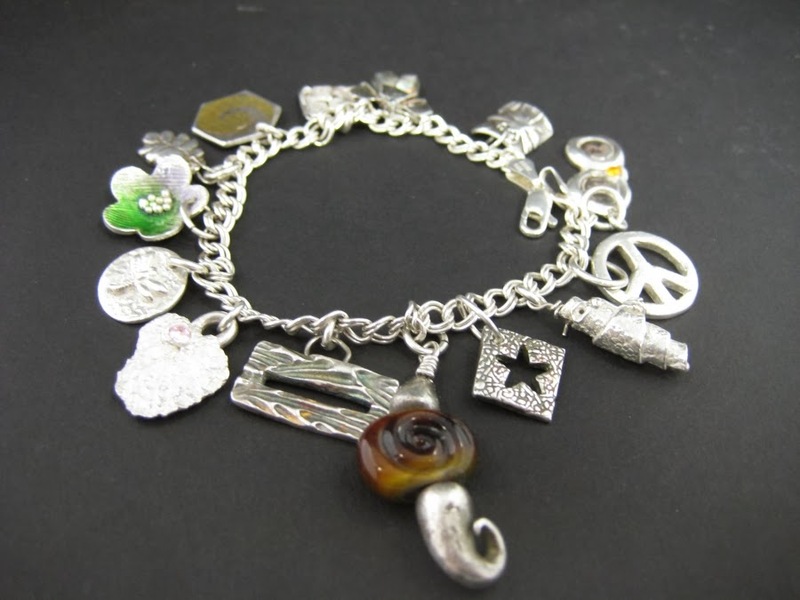 Charms have been around since ancient times, but charm bracelets as we know them are a much more recent innovation. People of many cultures made and wore amulets or talismans, which were associated with magic, protection, and spirituality. Today we wear charms simply for their beauty and the pleasure they give us. The Babylonians may have been the first to wear charms on a bracelet, from around 700 B.C. Ancient charms were made of many materials—shells, stones, clay, bone. Later the tiny figures were carved of ivory and semi-precious stones, and still later they were cast in metal. 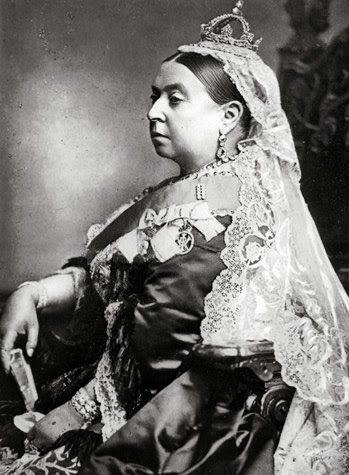 Queen Victoria helped popularize charms and charm bracelets in the mid-1800s. Wealthy people at the time wore small, custom-made “charms” as pendants or ornaments on their watch fobs and clothing. The queen wore small lockets containing miniature portraits and locks of hair of her deceased loved ones. After Prince Albert died, she led the trend in “mourning charms” and bracelets carved of jet to be worn with the black dresses she favored for the rest of her long life. With the coming of the Industrial Revolution, charms were machine-made and mass-produced. Now the middle class could afford the ornaments that used to belong only to the wealthy. In the United States, Tiffany and Co. introduced its first charm bracelet in 1889. This link bracelet held a dangling heart. People could add more tokens to the bracelet. But it wasn’t until after World War II that charm bracelets reached the pinnacle of popularity in the U.S. Soldiers brought souvenir charms home from Europe, and soon jewelers were creating new styles of charms, which were given as gifts on any occasion. Travelers bought miniature representations of monuments they visited, such as Eiffel Towers or the Statue of Liberty. Many women collected charms that symbolized important events in their lives. Hearts, graduation caps, baby shoes, and tokens engraved with significant dates were a few. The bracelets remained very popular in the 1950s and 1960s, with movie stars such as Elizabeth Taylor and Joan Crawford seen displaying their own bracelets. You can read more about charm bracelets on the website of Rembrandt Charms, the company that made the bracelet for the cover of my new book, The Charm Bracelet, at: http://is.gd/cdNSrN . 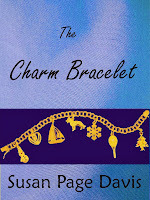 This week I’m giving away two copies of the e-book The Charm Bracelet, a light Christian romance. Winners who do not use e-books can wait a few weeks for the print copy of this book or choose another of my books. I have never heard the history behind charm bracelets before--very interesting! 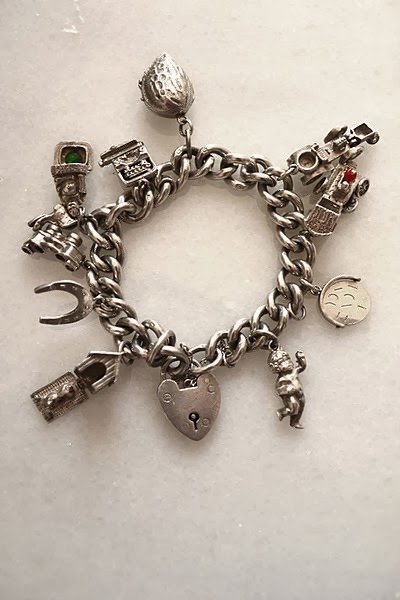 I've always wanted a charm bracelet but for whatever reasons I've never actually gotten one, but still love to see them and find out the "story" behind people's charms! Thanks for a great post! I think there's a lot of speculation out there about it. Lots of people wore "charms" or "amulets" before there was such a thing as a "charm bracelet." A lot were worn like necklaces. But yeah, I found it very interesting. I wonder if you're too young to have been in the heyday of the charm bracelet. Those of us born 1940-1960 probably were the right age at the right time for what are now considered vintage charm bracelets. I always wanted a charm bracelet but never had one. thanks for sharing. I have your book already. Jenny, I'm pretty sure you are also younger than the charm bracelet craze of the '50s and '60s. I could be wrong, ha, ha. I don't know if they caught on in Australia the way they did here, either. Anyway, thanks for getting my book! That is so cool. here I remember a lot of girls had them when I was young so early 70's also they had a bracelet they wore that had to be cut off. I did have a few charms and still do (cricket bat, bike) but not the bracelet. 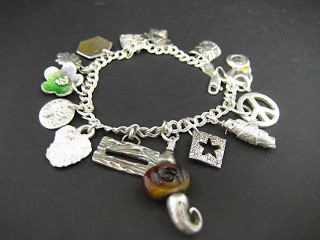 Interesting history behind charms and charm bracelets. My husband gave me a charm bracelet our first Christmas in 1959. The only charm on it at the time was a tiny calendar of the month of October with diamond on our wedding date. After that we added charms for special events and places. I had a birthday cake, a BU symbol for Baylor, little charms from vacations. It was full and I loved wearing it. When out house was broken into in the 70's, it was one of the items stolen and never recovered. After that, my boys and their wives started a James Avery charm bracelet with a butterfly and angel then I received a new boy or girl head for each grandchild. I still have that one. For my 75th birthday they gave me a Briton Necklace with three charms to signify our three sons and two charms that say Mom and Family on them and a Briton bracelet with all of our on it. Can I download your book to my Nook or Kindle. Martha, I loved reading about your bracelets. I'm sorry you lost the first one! They are real memory books, and I would think the sentimental value is usually higher than the monetary value. Shame on them for stealing it! 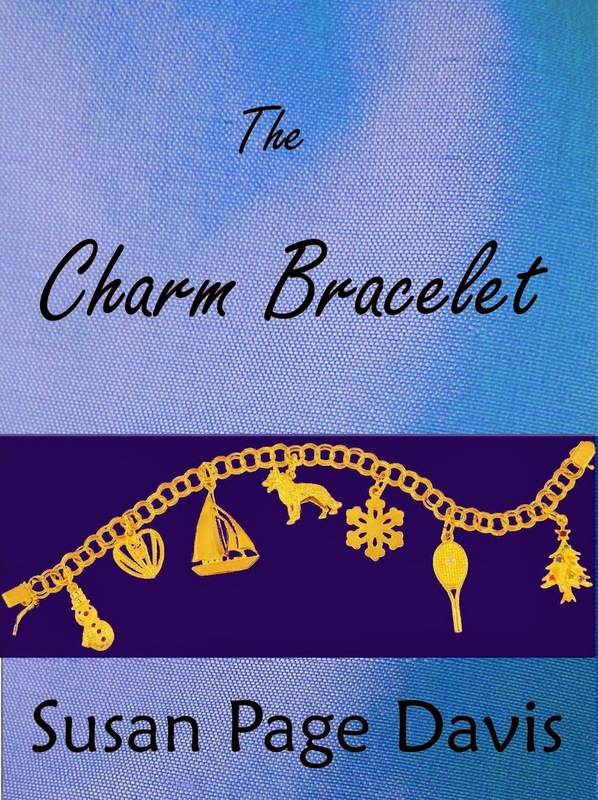 Yes, you can download The Charm Bracelet to Kindle. Right now it's not on Nook, but I understand can be converted. Duh! It's too early for my brain. That's "our" house, not "out" house., and it's Brighton not Briton. Wow, I need my hot tea! No problem, dear. I knew what you meant! I have been blessed with two charm bracelets. The first is a silver one, given to me when I was in junior high with a horse charm on it. People gifted me with others over the next few years--a report card, an airplane, a Betty Crocker Homemaker charm award I won in my home ec class, and a few more. The second is a gold-tone U.S. Coast Guard bracelet. My brother was a career Coast Guard officer, and he gave it to me. It has the letters U, S, C, and G as charms, along with the Coast Guard's coat of arms or seal (not sure what they call that symbol officially). I think he was hoping I'd join the Spars. Anyway, I love my keepsakes. Joy, it's amazing what bypaths our research leads us down. Yesterday I had to find out when they started putting the portraits on paper money. Maybe I'll do a post about that sometime! Thanks for joining us. Susan, Very interesting post on charm bracelets. I never had one but gave them to my first granddaughter. So much history behind them thank you. Glad you enjoyed it, Jackie! Everyone seems to like charm bracelets, even if they don't want to actually wear one! Susan, this is so interesting and the first I've read on charm bracelets. I have a lovely silver one which was a Mother's Day gift and has the names and birth dates of my children. I haven't worn it in years, but you've inspired me to dig it out again.. Thanks, Margaret! I have one of those discs with the date on mine from my sister's wedding, when I was a bridesmaid. All fond memories on the charm bracelet! sounds like such a good story and I have never had a charm braclet myself. I would like to have one for each of my children and grandchildren. They make lovely gifts for girls, Linda, and there are tons of resources for charms these days. Interesting history on charm bracelets. I received my first bracelet at Christmas 2004 and it's an Italian charm bracelet. I was visiting my cousins in California and I live in Louisiana. They live close to Palm Springs, so one of the charms was Santa leaning against a Palm tree. I love it. Really enjoyed your post and all of your books are fantastic. Thank you for the chance to win this giveaway and please enter my name. The more recent Italian charm bracelets look quite different from the vintage ones, but the sentiment they evoke is the same! I don't have one yet, but they intrigue me. Thank you, Barbara. Wow--eleven children! We have six. Your mother was a brave woman. I'll bet you all adored her. Hi Susan, I love your post today. I found learning about the charm bracelet to be very interesting. Charms given with special interests in mind or wonderful vacation spots were always so special. To me, charm bracelets represent special memories filled with love. I agree, Melanie! I wish I had kept adding to mine--but it's not too late. Any of us can start now--or start over. I have always loved charm bracelets and the story behind each charm! Thank you for sharing the history of these special treasures! You're welcome, Britney! It was fun to research this topic, and I'm finding a lot of women connect with it. Seems an awful lot of women have or had them and treasure the memories. Love this site and the way we get to learn more each time, I didn't know the history behind them or they started that long ago. I had been thinking of getting one for a young neice and adding over the years recently. thanks for sharing Susan. You're welcome, Paula. I find intriguing stuff when I start looking at the history of everyday objects. Thanks for coming by! Glad you paid us a visit, Jo. Charm bracelets are one of those things that can span generations. I love that Paula wants to give one to her niece, and your daughter gave one to you. I do think the significance of the tokens we choose makes them both unique and relevant to our families. I wonder if the company, "Orgiami Owl" got their idea for the necklaces they sell from charm bracelets? I too have a charm bracelet that is "loaded with memories". Thanks for the information of how they came to be. Could be, Janet. Glad you stopped by. You made it in time, Maxie! I guess I didn't say what day I would send the names to the random draw, but I'm planning on Nov. 26. There's still time. Thanks for coming by. Thank you for sharing the history of charms and charm bracelets. I've loved charm bracelets for as long as I can remember, and received one for my birthday when I was 10 years old. My parents would gift me with a special charm for special occasions, which were added to the bracelet. Eventually I received a second bracelet because the first one was filled. The second bracelet is also full, and the memories that come flooding back whenever I study those charms is heartwarming. Thank you for offering your book in this contest. I'd love to read it! What a wonderful archive you've collected, Nancee! Family treasures. Fun article! I have two charm bracelets. One was started when I was born and has tiny charms like Mickey Mouse, a turtle and a high chair that have moving parts. The second one I got when I was 10 and it has wonderful memory charms like a ballerina to celebrate 10 years of dancing, a blue ribbon for a state dance team title and a double decker bus for a visit to Victoria, BC. How fun, Merry! Thanks for telling us about your very special bracelets! And the winners this time around are Joy (jumpforjoy) and Nancee. Thank you, everyone who took part. See you again soon, and enjoy those charm bracelets! What a great article. Full of history. Didn't think it went back so far.